Just in time for the year-end holidays, discover our wish list, featuring iconic products from our Houses. Given the array of exceptional creations by LVMH brands, choosing was definitely not an easy task! From December 19-24, we’re presenting curated selections from the different LVMH branches, in a fantastical and festive décor. Today’s list showcases exceptional Wines & Spirits. Krug Grande Cuvée sets the standard of excellence for Krug champagnes, fully expressing the richness and power of its assemblages. A delightful paradox, the wine reconciles maturity and freshness, a full body and elegance, masculine and feminine. Made from 120 wines from different years, with recommended cellaring of at least six years, the remarkable Krug Grande Cuvée took 20 years to craft. The soul of the oldest Champagne house, this Blanc de Blancs is made of 100% Chardonnay grapes, mainly from premiers crus Côte des Blancs and Montagne de Reims Champagne vineyards. A fruity and floral wine, it is enhanced by slow maturation in Ruinart’s celebrated chalk cellars. X.O., for Extra Old, is the symbol of Hennessy excellence. 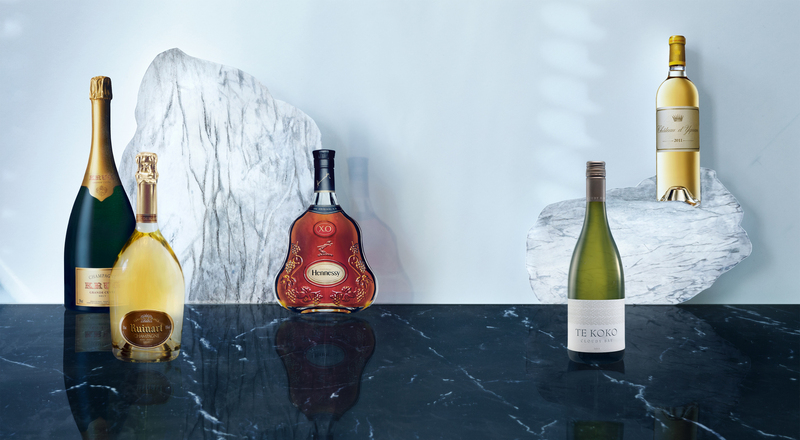 This cognac is a delicate alchemy of a hundred rare eaux-de-vie – some over 40 years old. A favorite of connoisseurs around the world since its creation in 1870, Hennessy X.O. illustrates the founding family’s conquering spirit with the crest – a raised arm brandishing a halberd – engraved on the bottle. Named after the Maori name for Cloudy Bay, Te Koko was born in 1991 from the idea of producing a truly distinctive New Zealand wine. The estate’s winemakers use an indigenous wild yeast during the fermentation of sauvignon blanc grapes from its vineyards. Complex and creamy with floral and smoky notes, Te Koko has become synonymous with excellence. The 2011 vintage of the only Premier Cru Classé Supérieur de Bordeaux reveals a dazzling golden robe. The rare complexities of the aromas reappear in the mouth after a sumptuous attack for a memorable tasting experience marked simultaneously by harmony, opulence and refinement.